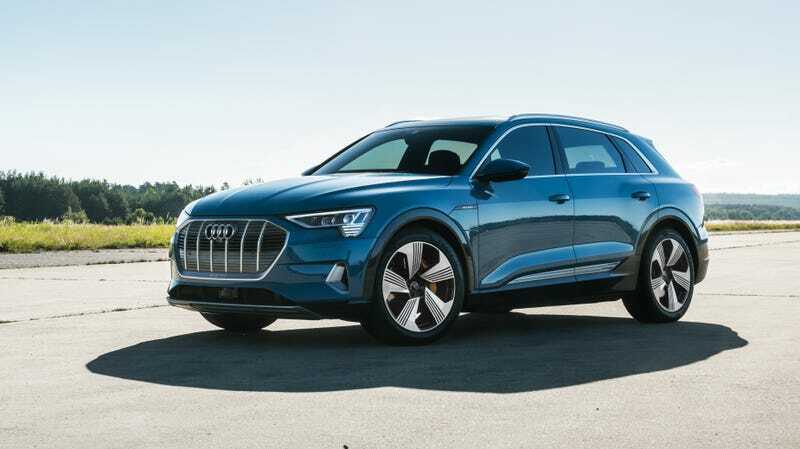 When Audi first unveiled specs for the 2019 E-Tron all-electric SUV, its claimed zero-to-60 time of 5.5 seconds was pretty impressive. But now that we’ve learned about its range? We’re less impressed. Despite some delay over software updates, Audi has announced the start of E-Tron deliveries in May. It also provided the car’s EPA-estimated range of 204 miles, according to a press release. And translated to real-world mpg, that’s 74 miles city and highway combined. That is... not great. Especially when you compare the E-Tron and its 95-kWh battery to other luxury big cars in its segment. The Jaguar I-Pace has an estimated 234-mile range from a 90 kWh battery. And Tesla Model X 75D, before it was discontinued, had an estimated range of 237 miles from a 75 kWh battery. Now, the closest Tesla to the E-Tron is the Model X Long Range, which has 295 miles of range. For most people using their EVs on daily errand runs and commutes, the range doesn’t matter a whole lot. But it’s still a way of benchmarking an EV’s capabilities and one that many buyers very much consider. We’ve criticized Mercedes for the very same thing in the past. Audi didn’t disclose the E-Tron’s range during its unveiling last September, but did mention that the car could hit about 250 miles based on the WLTP European standards. As InsideEVs has previously reported, WLTP ratings and EPA ratings are not synonymous. At least the Audi can charge quickly, though. The automaker estimates that just 10 minutes at a 150 kW public charger will result in 54 miles, while 30 minutes will result in 163. And it can tow up to 4,000 pounds with the towing package. That battery is also designed to use 88 percent of the total capacity because this “ensures battery longevity, repeatable performance and peak charging power for longer amounts of time during the charge cycle.” The E-Tron has 355 horsepower but can put out 402 HP with a boost mode. It’s also worth pointing out that the Audi’s $74,800 price has the more expensive Jaguar and Tesla beat. And you can still get it with the federal tax credit of $7,500. They did not say whether or not there are any longer-range models planned.